DO-17101-01 was succesfully added to your cart. A fast easy way to NIST certification. NIST certification for my vane anemometer was fast and easy. With standard turn around I received the instrument back in several weeks. The documentation was professionally done and E-mail communication was sent regarding the status of the anemometer in a timely manor. It was a little pricey, but I would use this service again. I was very disappointed to open my anemometers boxes and find them still dirty. I was also unimpressed by the calibration. We use these anemometers in low velocities, which the calibration didn't check. Anemometer calibration used to be expedient and dependable. Lately Davis became very back-logged and turnaround now takes 5 times as long. Also, Anemometers are failing more frequently, even newer ones. 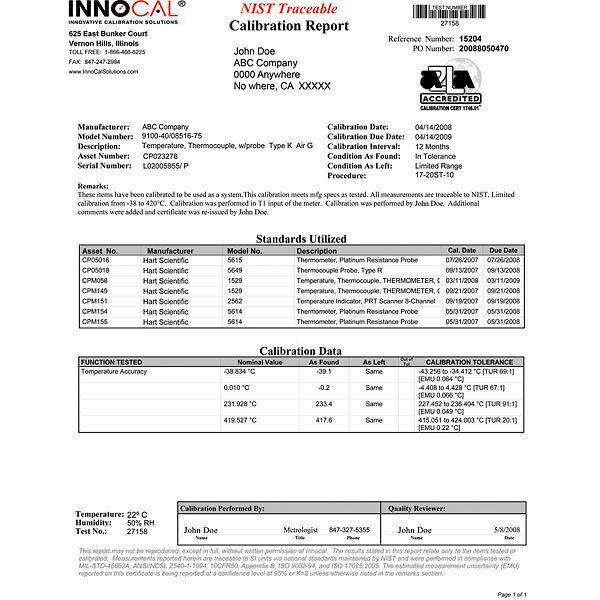 We have recently started researching other laboratories for calibration needs. Merchant response: Your point is well taken. With this said, we have made an investment in acquiring the necessary standards/fixtures to complete these types of calibrations quickly. You should see a drop in the turn around time soon. QC Dept.